In System Biology, iterations of wet-lab experiments followed by modelling approaches and model-inspired experiments describe a cyclic workflow. This approach is especially useful for the inference of gene regulatory networks based on high-throughput gene expression data. Experiments can verify or falsify the predicted interactions allowing further refinement of the network model. Aspergillus fumigatus is a major human fungal pathogen. One important virulence trait is its ability to gain sufficient amounts of iron during infection process. Even though some regulatory interactions are known, we are still far from a complete understanding of the way iron homeostasis is regulated. In this study, we make use of a reverse engineering strategy to infer a regulatory network controlling iron homeostasis in A. fumigatus. The inference approach utilizes the temporal change in expression data after a change from iron depleted to iron replete conditions. The modelling strategy is based on a set of linear differential equations and offers the possibility to integrate known regulatory interactions as prior knowledge. Moreover, it makes use of important selection criteria, such as sparseness and robustness. By compiling a list of known regulatory interactions for iron homeostasis in A. fumigatus and softly integrating them during network inference, we are able to predict new interactions between transcription factors and target genes. The proposed activation of the gene expression of hapX by the transcriptional regulator SrbA constitutes a so far unknown way of regulating iron homeostasis based on the amount of metabolically available iron. This interaction has been verified by Northern blots in a recent experimental study. In order to improve the reliability of the predicted network, the results of this experimental study have been added to the set of prior knowledge. The final network includes three SrbA target genes. Based on motif searching within the regulatory regions of these genes, we identify potential DNA-binding sites for SrbA. Our wet-lab experiments demonstrate high-affinity binding capacity of SrbA to the promoters of hapX, hemA and srbA. This study presents an application of the typical Systems Biology circle and is based on cooperation between wet-lab experimentalists and in silico modellers. The results underline that using prior knowledge during network inference helps to predict biologically important interactions. Together with the experimental results, we indicate a novel iron homeostasis regulating system sensing the amount of metabolically available iron and identify the binding site of iron-related SrbA target genes. It will be of high interest to study whether these regulatory interactions are also important for close relatives of A. fumigatus and other pathogenic fungi, such as Candida albicans. A major workflow in Systems Biology is an interlocking circle between experimental and theoretical work . Experimentalists perform high-throughput experiments in order to monitor the response of a biological system to an external stimulus. These data is then used to construct spatio-temporal models from which reasonable hypotheses are generated. These hypotheses are experimentally verified or falsified. Using the results of these experiments, scientists are able to refine the model and thus generate new knowledge . One way of describing biological systems are networks. Networks are graphical representations, where the nodes represent the objects of interest and edges represent relations between these objects . Network models help to explain, understand and describe the functioning of a cell . In many cases we do not know the underlying interaction networks within the system of interest. Network inference aims at the deduction of these networks utilizing high-throughput data and prior knowledge. The inference of gene regulatory networks consists of three parts: the identification of potential regulators, the prediction of target genes, and the inference of the mode of interaction (e.g. activation or repression). A number of approaches are established to perform this task, such as setting up Bayesian Networks , information theoretical approaches [6–8], regression based inference [9–11], and differential equation models [12–17]. A number of studies successfully applied these methods for different biological purposes, e.g. modelling of immune diseases [10, 13], full genomic models of Escherichia coli  and Saccharomyces cerevisiae , and models of pathogenic fungi . It has been shown that the integration of different data sources improves the reverse engineering approach [10, 19–21].Since different data sources might be contradictory, it is advantageous to softly integrate them during the modelling procedure. That means, proposed interactions can be scored by the confidence of the prior knowledge source and might be removed if they contradict too much to the measured data. A recent study shows how the Systems Biology circle supports network inference . Due to the large amount of available data and knowledge E. coli is best suited as model organism for network inference. However, this task is more difficult for pathogenic fungi by virtue of the small amount of data and small number of known interactions. Aspergillus fumigatus is an airborne saprophytic fungus . Humans constantly inhale numerous conidia of A. fumigatus, which are usually eliminated by the immune system. However, in immunocompromised individuals the fungus can cause life-threatening infections . In fact, the number of infections has been dramatically increased due to the growing number of immunocompromised individuals [24–26]. The human host evolved a number of strategies to prevent microbial infection. One important strategy is to keep iron away from the pathogen . Iron is an essential metal required as a cofactor for several proteins, as well as for a number of biochemical processes. However, within the human host, iron is bound to proteins such as haemoglobin, ferritin, transferrin, and lactoferrin. Consequently, there is almost no free iron available . Thus, the acquisition of iron is an important virulence attribute of most pathogens. During co-evolution, A. fumigatus has developed a number of efficient iron acquisition pathways: 1) reductive iron uptake, 2) uptake via siderophores, and 3) low-affinity uptake (for a more detailed description see ). Since excess of iron is toxic for a cell, iron homeostasis needs to be tightly regulated in A. fumigatus. The knowledge about the molecular interactions underlying these regulations is still fragmentary. The transcription factors SreA and HapX have been identified as a counter pair [30–32]. Under iron replete conditions, SreA is activated and represses iron uptake. Under these conditions, SreA also represses hapX transcription. Since HapX is a repressor of iron consumption pathways, SreA indirectly activates iron consumption. Moreover, HapX also acts as an activator of iron acquisition. A number of target genes are known for both regulators, however we are still far from a complete understanding of iron homeostasis in A. fumigatus. Recently, we proposed a model predicting regulatory interactions for iron uptake of another fungal pathogen, Candida albicans, when the fungus is adhering to and invading into human epithelial cells . 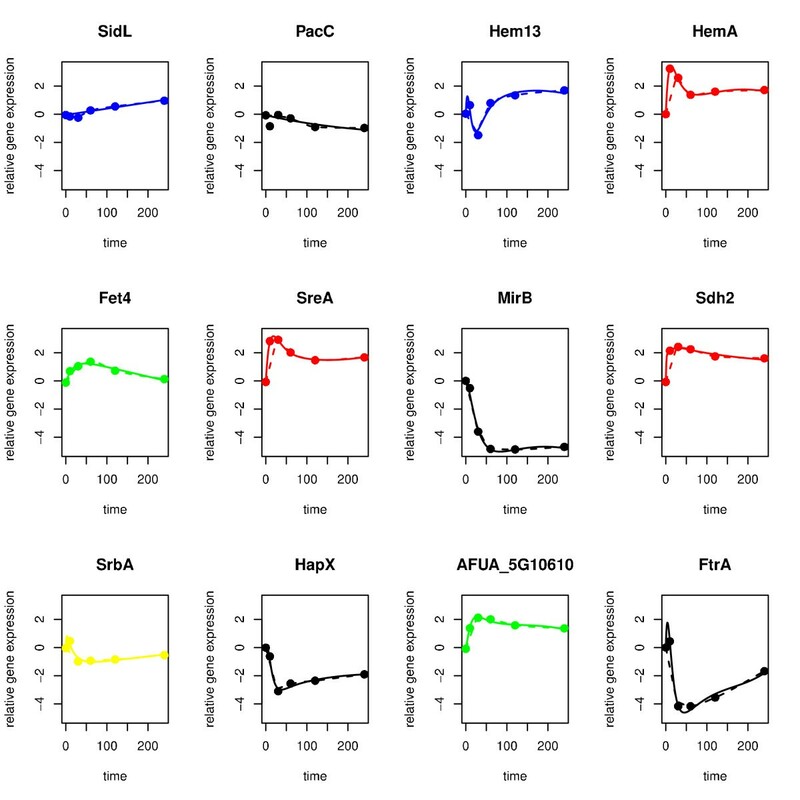 The model is based on time series expression data during experimental infection of reconstituted human oral epithelium. The usefulness of these data lies in the fact that it re-samples important parts of a real infection scenario. On the other hand, in the previous modelling approach a number of environmental parameters are not constant during infection, such as pH and nutrient availability. This may have caused side effects and made it difficult to decide whether the proposed interactions are purely based on changes in iron availability or other environmental parameters. Such environmental variations finally hamper experimental verifications of the proposed interactions. The use of in vitro time series expression data after a change from iron depleted to iron replete conditions will help to decide which interactions C. albicans uses to regulate iron homeostasis. For A. fumigatus, such time series expression data is already available and utilized in this study. In the present work, we propose the first computational model of the regulation of iron homeostasis genes in A. fumigatus using high-throughput gene expression time series data after a shift from iron starvation to iron replete conditions . It is based on a set of linear differential equations and utilizes selection criteria such as sparseness and robustness [17, 21, 33]. 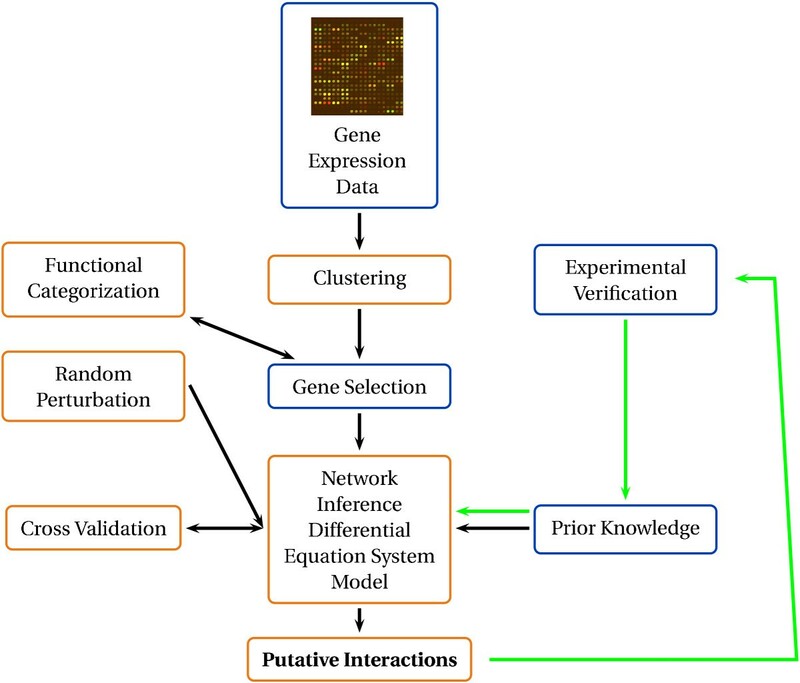 Since the soft integration of prior knowledge has been shown to improve the reliability of the predicted networks [10, 19–21], our modelling approach softly integrates three kinds of prior knowledge: Northern blot analysis under limited iron [31, 32], microarray expression analysis of transcription factor knock-out mutants [31, 32], as well as the occurence of transcription factor binding motifs analysis in regulatory regions of genes [31, 34–36]. The inferred model predicts new transcription factor to target gene interactions. A recent study utilizes Northern blots and experimentally verifies two of these interactions , while another predicted interaction is falsified and one remains unevaluated. Using the results of the recent experiments as additional prior knowledge, we are able to refine our model. The final network model predicts a number of SrbA targets. To study, whether or not the transcriptional regulator directly binds to these target genes, we performed motif searching that lead to the identification of potential SrbA binding sites in the promoters of the predicted target genes. Indeed, wet-lab experiments demonstrate high-affinity binding capacity of SrbA to the promoters of hapX, hemA and srbA. Schrettl et al. performed full-genomic transcriptional profiling of A. fumigatus as response to the change from iron depleted growth to iron replete growth . They monitored gene expression at five timepoints after adding iron to the culture medium: 10 min, 30 min, 60 min, 120 min, 240 min. We used the preprocessed (i.e. normalised and logarithmised) data of Schrettl et al. . Figure 1 gives an overview about the applied methods. Since clustering and network inference need complete data, we imputed missing values using the Bayesian Principal Component Analysis (BPCA) imputation from the R-package 'pcaMethods' . This method performed best among a set of different imputation methods (for more information see additional file 1, table S1). Overview of applied workflow. The green lines illustrate how the cyclic workflow of Systems Biology was applied in this study. Schrettl et al. identified 1147 genes to be differentially expressed within the wild-type strain comparing iron depleted and iron replete conditions . We added srbA to this set (see candidate genes for regulatory network model) and collected (imputed) expression values of these genes. We applied fuzzy c-means clustering  to this expression matrix. The optimal number of clusters was estimated as previously described [13, 17]. In short, 42 cluster validity indices (Dunn's index and the Davis-Bouldin index with 18 generalizations each as well as the silhouette width and five other indices as described in ) capturing different aspects of a clustering structure were used to assess the partitions based on 2 up to 20 clusters. The number of clusters that was ranked best by the most validity indices was chosen. 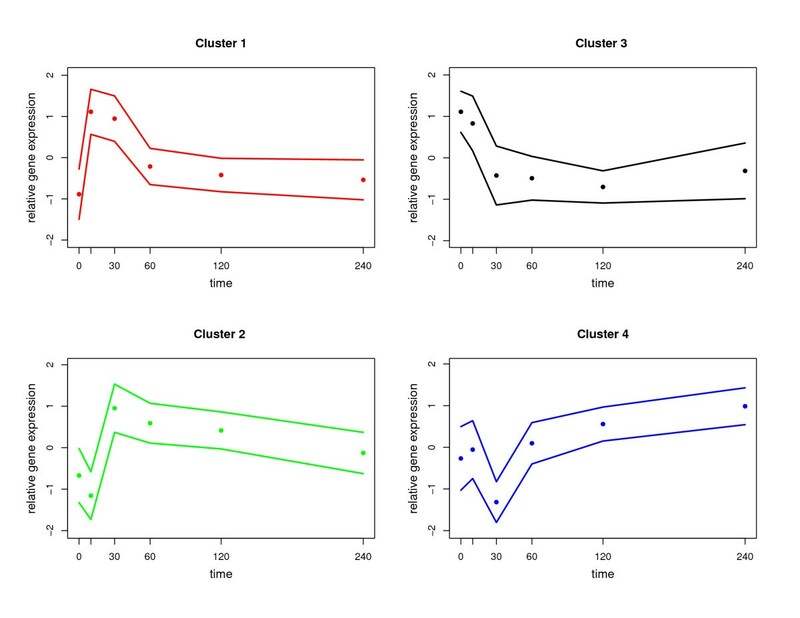 In order to identify key biological processes/functions most significantly enriched with genes within each of the clusters, we performed functional categorization and identified significantly overrepresented categories using the tool FungiFun . We applied both Funcat  (all four hierarchical levels) and Gene Ontology  (Biological Process and Molecular Function) categorization. It is based on a set of linear differential equations and models the temporal change of the expression intensity x i (t) of gene i (i = 1..n) at time t as the weighted sum of the expression intensities of all other genes and an external stimulus u(t) at time t (see equation 1). The external stimulus u(t) is modelled as a stepwise constant function representing the change from iron depletion to iron repletion. Based on the given time series data, the tool calculates the gene regulatory matrix W and the perturbation vector B. The parameter w i,j (component of W) represents an influence of gene j on the expression of gene i, while the parameter b i (component of B) represents the impact of the external stimulus given by the function u(t). Non-zero parameters define the edges of the regulatory network. A positive parameter w i,j denotes an activation and a negative parameter denotes a repression of gene i by gene j. The approach follows the selection criterion of sparseness. Using a heuristic search strategy it tries to minimise the number of non-zero parameters(interactions) which are necessary to fit to the measured data points. The approach follows the selection criterion of robustness, i.e. technical noise in measured mRNA concentrations caused by the microarray technology does not alter inferred regulatory interactions. This is achieved by iterating the network inference procedure 1000 times using randomly perturbed input time series data (Gaussian noise with mean 0 and standard deviation 0.05 added to the measured and pre-processed data) [13, 16]. Only edges which are confirmed by more than 50% of the iterations are considered to be robust. The inference approach uses prior knowledge (i.e. putative regulatory interactions based on additional data to time series expression data). Based on the confidence of the prior knowledge source, it is possible to score each proposed interaction. Since different data sources might be contradictory, it is advantageous to softly integrate them during the modelling procedure. If a proposed interaction contradicts the measured data too much it might be removed. If necessary, the tool adds new interactions not covered by the prior knowledge in order to fit to the measured data. Interactions included in the regulatory model might mainly be based on their occurrence in the set of prior knowledge, rather than on the expression data. Thus, we tested whether or not the predicted interactions are robust against changes in the set of prior knowledge by iterating the modelling approach 1000 times while randomly skipping 10% of all interactions in the set of prior knowledge in each run. Again, only edges which are confirmed by more than 50% of the iterations are considered to be robust. Source 3: Occurrence of the respective transcription factor binding motif in the upstream intergenic regions of iron homeostasis genes. Confidence score = 0.125. The score is additive, i.e., if an interaction is predicted by several sources the used score equals the sum over all confidence scores for the respective sources. Three DNA sequences with high binding-affinity to the transcriptional regulator Sre1 were identified in Schizosaccharomyces pombe . Sre1 and SrbA show high sequence similarity. Furthermore, the SrbA protein contains a basic helix-loop-helix/leucine zipper (bHLHZ) domain. This domain has been shown to specifically bind DNA in S. pombe . The three high-affinity Sre1 binding-sites are characterised by a conserved ATC at the 5' end and a conserved AT at the 3' end, while the remaining parts are highly variable (5'-ATCNNNNNAT-3'). For the human ortholog of Sre1 and SrbA, the adenosin and thymidin enable the contact with the protein . To predict a SrbA binding site in A. fumigatus, we first downloaded intergenic regions of genes predicted to be SrbA targets by our network model. Next, these intergenic regions were scanned for the occurrence of the three high-affinity binding sites of Sre1 allowing maximal two mismatches . Finally, we only considered those sites which contain the conserved 5' and 3' AT. To determine whether A. fumigatus SrbA recognizes the identified putative binding sites, the bHLHZ domain of SrbA (amino acids 161-267,"SrbA161-267" ) was produced in E. coli and purified. The protein domain was analysed by real-time in vitro surface plasmon resonance (SPR) binding assays. Immobilized DNA duplexes (see additional file 2 for experimental details ) were used to test whether or not the protein domain can bind to the predicted DNA sites. The BPCA (Baysian Principal Component Analysis) method gave best results for imputation (see additional file 1, table S1) and was thus chosen to impute missing values into the original gene expression data set. The optimal number of clusters for partitioning the expression data was found to be four (see additional file 3, figure S3). Scaled time series profiles are visualised in figure 2. Additional file 4 shows to which cluster each gene belongs to, while additional file 5 lists significantly overrepresented categories for the respective clusters. Cluster analysis results. The best partition consists of four clusters. Points: mean (logarithmised, scaled and centred) expression values of all genes in the cluster, lines: standard deviation. Cluster 1 consists of genes which show a quick up-regulation after adding iron to the culture medium. This cluster is significantly enriched with genes involved in iron-dependent processes including iron-sulfur cluster biosynthesis, heme biosynthesis, respiration, TCA cycle assembly as those categories are overrepresented according to Funcat (level 2-4) and to GO-Biological Process (GOBP). Furthermore, cluster 1 is significantly enriched with genes involved in transcriptional regulation. In fact, 17 genes belong to the GO category "transcription" (p = 0.0028). Among them are important regulators of iron homeostasis, namely the transcription factors SreA and PacC. Since the averaged expression profile in this cluster shows a quick up-regulation, further so far unknown regulators might be involved in regulating genes involved in iron homeostasis. Cluster 2 also shows a quick, but delayed, up-regulation. This cluster mainly consists of genes involved in RNA processing. Cluster 3 consists of genes which are highly expressed under iron starvation conditions and are therefore down-regulated after adding iron. Interestingly, all 49 genes belonging to the SreA regulon  are members of cluster 3, showing that the clustering partitioned the genes into biologically relevant groups. The majority of the characterized SreA target genes are involved in iron uptake, including reductive iron assimilation and siderophore mediated iron acquisition (Funcat level four). Another SreA target is the HapX-encoding gene. Taken together, these data demonstrate that Cluster 3 encodes the major genes required for adaptation to iron starvation. Cluster 4 mainly consists of genes involved in oxidation-reduction processes (GOBP). Its mean expression profile is characterized by a local minimum after 30 minutes followed by an up-regulation. Taken together, the best characterized gene sets are found in Cluster 1 with iron-dependent pathways and Cluster 3 with pathways that are important for adaptation to iron starvation. The co-clustering of many genes with yet unknown functions indicates similar features. In order to model a network, it is necessary to select a set of relevant genes, which will be represented by nodes in the network model. Table 1 summarises information about genes which are included in the network model. From each cluster, we chose a number of genes involved in important parts of iron homeostasis system, or genes coding for regulators of iron homeostasis. Genes used as candidates for the regulatory network model. As they are important regulators, SreA and HapX are parts of the model. 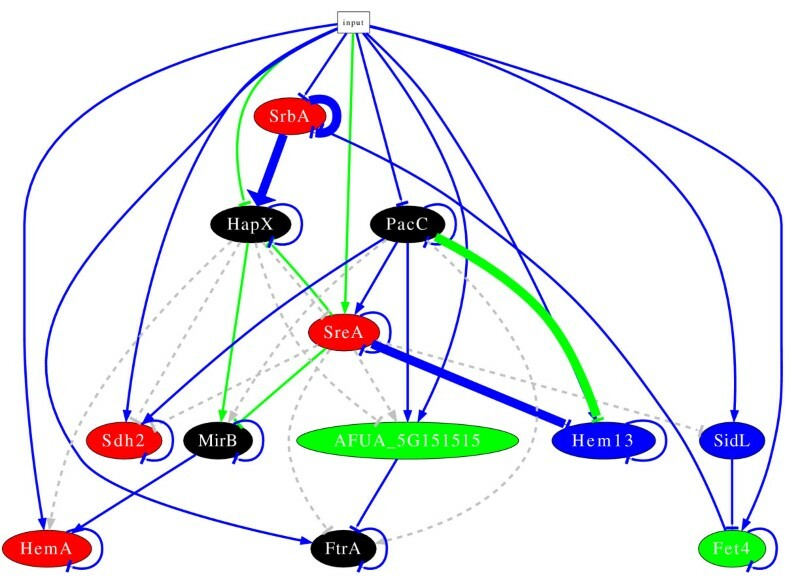 Another regulator is PacC, which has been shown to be involved in regulating siderophore biosynthesis genes in the close relative Aspergillus nidulans . Moreover, its C. albicans orthologue Rim101 might be involved in regulating iron acquisition genes during (experimental) oral infection . Finally, we included the regulator SrbA because recent data suggest that it might be involved in regulating the metabolically available iron level. The C. neoformans orthologue is essential for growth under iron starvation and regulates reductive iron uptake . In A. fumigatus, the protein is activated under ergosterol-limited conditions and might be involved in activating iron uptake . Finally, expression of srbA is downregulated under iron replete conditions . However, the fold-change of srbA is slightly smaller than the cut-off applied by Schrettl et al. for the identification of differentially expressed genes. In order to have genes coding for proteins involved in different parts of iron homeostasis, we included a low-affinitiy iron transporter (Fet4, cluster 3), one high-affinity iron transporter (FtrA, cluster 3), one protein involved in siderochrome-iron transport (MirB, cluster 3) and one protein involved in haem uptake (HemA, cluster 1). Furthermore, we included genes coding for proteins involved in siderophore and haem biosynthesis (SidL, Hem13, cluster 4), as well as genes coding for iron-sulfur cluster proteins (Sdh2 cluster 1 and AFUA 5G10610 cluster 2). Note, that we only used one imputed value for network inference, namely the expression value of sreA at timepoint zero. Table 2 lists the prior knowledge used in this study. The table lists regulator-target gene interactions, the type of interaction, the source of prior knowledge, the score used and references. The second part of the table lists additional prior knowledge we exploited in order to refine the model within the second round of modelling. "Input" denotes the fact that a target gene is regulated by the external perturbation (shift from iron replete to iron depleted conditions). As prior knowledge source 1, we used Northern blot results of transcription factor knock-out mutants comparing iron replete conditions with iron depletion. In that way, we identified two potential target genes of HapX [29, 32] and three for SreA . As prior knowledge source 2, we made use of the full genomic gene expression profiles of transcription factor knock-out mutants, i.e. we added a potential interaction if a gene is differentially expressed in the knock-out mutant compared to the wild type. Altogether, we identified eight potential interactions this way [31, 32]. For prior knowledge source 3, we added a potential interaction if the respective binding motif of a transcription factor occurred in the regulatory region of genes included in the model. For SreA we used the consensus binding motif 5'-ATCWGATAA-3'  which we found in three potential target genes. The PacC consensus binding motif 5'-GCCARG-3' of the A. nidulans  was also found in three potential target genes. HapX interacts with the 5'-CCAAT-3' binding box in A. nidulans . In order to test whether or not this interaction also occurs in A.fumigatus, we proposed one gene with the CCAAT-box in their promoters as HapX targets. Following the modelling approach described in the methods chapter, we inferred two regulatory network models. The first model is based on the prior knowledge being available previous to the study of Blatzer et al. . Figure 3 shows that the initial model (i.e. before tested for robustness) fits well to the measured kinetics. Figure 4 presents the network after removing non-robust edges. 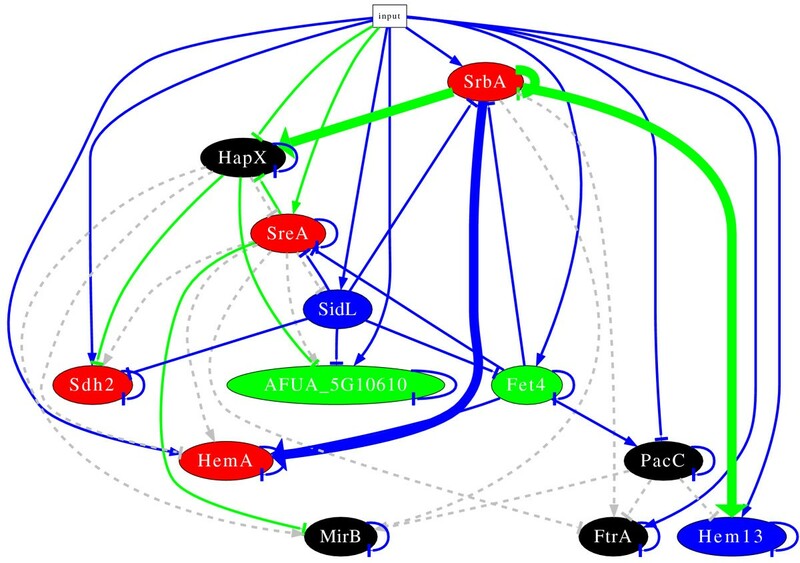 The model explains how SreA and HapX interact to regulate iron homeostasis genes and elucidates the role of further regulators. The model predicts the repression of hapX by SreA, which is supported by the SreA binding site in the upstream region. As expected, HapX itself does not repress sreA, even though this interaction is supported by source 3. This interaction only takes place under iron deplete conditions . The known repression of mirB by SreA  was confirmed by our model. This shows that our modelling approach is capable of finding de-novo biologically relevant interactions. Table 3 summarizes target genes of transcriptional regulators newly predicted by the model. Of high interest is the activation of hapX by SrbA. If sufficient amount of metabolic iron is available, SrbA might down-regulate iron consumption by activating hapX. Data fit for the initial model. Data fit of the initial model (i.e. before refining the prior knowledge and before testing for robustness). Dots: measured data points, dashed lines: interpolated data points, solid lines: model-simulated data points. Inferred regulatory network before refinement of the prior knowledge. The node colour denotes the cluster the gene belongs to. An edge between two nodes represents an interaction; arrows are activations while bars are repressions. Green edge: based on measured kinetics, consistent with prior knowledge, and robust(found more than 50% in models based on randomized input time series data and cross-validation of prior knowledge); blue edge: not in prior knowledge, based on measured kinetics, and robust; Grey edge: predicted by the prior knowledge but contradicting time series data, not in the model. For each regulator, newly predicted target genes are shown. A target gene is counted as "newly predicted" if it was predicted by the time series data without prior knowledge, or if it was predicted by prior knowledge based on the occurrence of transcription factor binding motif (source 3) and was found to be consistent with the gene expression data. The second column of the table lists the results after refining the model. Bold genes have been validated by Northern blots  (before refinement) or binding to SrbA (after refinement). The interaction marked with asterix was falsified. Similar to A. fumigatus, the C. neoformans SrbA ortholog activates genes involved in high-affinity iron uptake of iron, including genes in both siderophore-mediated and reductive iron transport, as well as heme biosynthesis . Moreover, heme biosynthesis, including Hem13, is activated by the SrbA orthologs in S. pombe and C. neoformans [43, 47]. Since most oxygen-dependent enzymes are also iron/heme-containing, the iron starvation response is often coordinately regulated with the response to hypoxia . Therefore, the cellular needs for oxygen and iron are tightly linked, which most likely provides the rational for coregulation of iron, heme and oxygen metabolism by SrbA in A. fumigatus. Furthermore, the model newly predicts two regulators of hem13. PacC and SreA are predicted to down-regulate this gene under iron deplete conditions. Finally, the model predicts a number of self-repressing interactions. These self-repressing interactions can be interpreted as degradation of the mRNA. In a recent study, Blatzer et al. performed gene expression analysis under iron replete and iron depleted conditions of a number of genes involved in iron homeostasis using Northern blots. The special focus of this study is the regulatory role of SrbA. Results of the study verify the activation of hapX by SrbA which was predicted by our first model (see figure 4). This shows that our modelling approach is not only able to include current knowledge but also correctly predicts interactions. Note, that no prior knowledge was used to predict this interaction. Another predicted interaction was falsified by the experimental results . It turns out from the Northern blot analysis that there is no evidence that SreA represses hem13. Instead, the experimental study indicates an activation of hem13 by SrbA. The interaction between PacC and hem13 was not experimentally tested. Having the experimental results of the recent study at hand , we were able to complete the prior knowledge in order to refine the network model. Table 2 (second part) lists the interactions additionally included as prior knowledge in the next modelling round. From a methodological point of view, this modelling round followed exactly the same strategy as the first one, i.e. we identified interactions which are robust against technichal noise in the mRNA concentration and do not change when we randomly skipping parts of the prior knowledge (see methods). Figure 5 shows a visualization of the model. Additional file 6, table S6 displays results of the resampling by perturbation of input data and cross-validation. Alternative configurations of the resampling were studied showing similar results as presented (data not shown). Due to the lack of a "gold standard" for the "true" network we are unable to decide about the best configuration of resampling. Inferred regulatory network after refinement of prior knowledge. For description see figure 4. The questionable interactions predicted by the first model do not occur in this model any more. In the new model, hem13 and hapX are activated by SrbA, which is in agreement with the new prior knowledge . By contrast, the activation of ftrA and mirB by SrbA was not found. Instead, the refined model predicts a direct activation of hemA by SrbA. This activation was already predicted before refinement of the model, but the activation was indirectly indicated in figure 4. The refined network model consists of four target genes for SrbA. Two of them, hapX and hem13, have been validated by Northern blots , while the self-repression of srbA and the activation of hemA remain untested. In order to test these two interactions and to see if the Northern blots findings are a result of a physical interaction, we predicted SrbA binding sites using motif searching (see methods). For experimental verification, we used real-time in vitro surface plasmon resonance (SPR) binding assays of the predicted binding sites and the purified SrbA-DNA-binding-domain (see methods and additional file 2 for details and figures). Table 4 summarises the results. The predicted binding site within the srbA promoter (-735 to -726) has no mismatch when aligned to the consensus sequence of high-affinity sites in S. pombe. A. fumigatus SrbA161-267 shows high-affinity DNA-binding responses that fit to a K D value of 0.63nM for this binding site. By contrast, only low-affinity binding (K D > 300nM) was observed for a DNA duplex mutant that served as negative control and altered the srbA binding motif from ATCATACGAT to ATATAACATA. Furthermore, high affinity SrbA161-267 binding was observed as well with putative binding sites that had only one mismatch compared to known binging sites in S. pombe. Kinetic binding responses on duplexes encoding hapX (-1340 to -1331) and hemA (-527 to -518) promoter regions fit with K D values of 4.6nM and 4.2nM, respectively. Additionally, we identified two sites with weak binding in hapX and hemA, respectively. Taken together, SrbA has high-affinity binding capacity to binding sites in hapX, hemA and srbA. Together with our predicted network and the Northern blot analyses , these results suggest a direct physical interaction of SrbA with these target genes. The consensus of the high-affinity sites is 5'-ATC[G--A][T--G][A--G][C--T][G--C]AT-3'. We used the experimentally validated sites to scan for further putative SrbA target genes within the A. fumigatus genome, allowing up to 2 mismatches in the variable region (see additional file 7, table S7). About 13% of the A. fumigatus genes contain one of these sites with maximal one mismatch in their regulatory region. A functional categorisation of this gene list resulted in overrepresented functional categories such as "Heavy metal binding (Cu, Fe, Zn)" and "Lipid, fatty acid and isoprenoid metabolism". This adds evidence to the hypothesis that SrbA links ion concentration and fatty acid metabolism. The binding of SrbA to five predicted binding sites was analysed. Results indicate three high-affinity binding sites in promoter regions of hapX, hemA and srbA. The asterix denotes a mutated binding site. Mutated nucleotides are underlined. k a = association rate constant, k d = dissociation rate constant, K D = k d /k a equilibrium dissociation constant. In this study, we propose a modelling approach based on a set of ordinary differential equations. Even though this approach fits well to the measured time series data, it has the drawback that it is inappropriate for large-scale modelling. In general, a large number of genes being part of a model leads to a large number of parameters to be identified, which may result in over-fitting of the data. Our modelling approach aims at inferring a sparse network (i.e. many parameters are zero) and makes use of resampling techniques where the data are perturbed in a random manner (see chapter "Network prediction" point 4 and 6). Both attempts help to prevent over-fitting. Furthermore, we restrict the number of genes, thereby leading to a smaller number of parameters to be identified. The selection of those genes that are included in the model are directed from experimental findings. However, some additional genes which might be involved in iron homeostasis are not included in the model. Furthermore, there is a number of so far uncharacterised genes which might play a role. The clustering of the expression data helps to get an idea about those genes. One gene of each cluster in the proposed regulatory model could be thought of a cluster representative. In this way, regulatory interactions inferred by our model might be transferred to other pairs of genes belonging to the respective clusters. With the knowledge of co-expression patterns and the regulatory influences proposed by our model, it might be possible to obtain an idea about the function of so far uncharacterised genes. The modelling strategy makes use of prior knowledge. The cross-validation procedure helps to prevent the model from adapting too much to the given knowledge. However, the prior knowledge incooperated into the model could be changed. In general, we could add more interactions when making use of knowledge based on other organisms. It remains to find out what organisms could be used for this task, i.e. what the maximal evolutionary distance of an organisms that could be used as prior knowledge source is. This also relates to the question of how we chose the local scores for each interaction. The scoring sheme used in this study was already successfully applied . However, when including information from an evolutionary distant organism this scoring scheme needs to be expanded. For example, Northern blot analysis revealed that mirB is activated by PacC under alkaline conditions in A. nidulans . This would add another category of prior knowledge ("Northern blots of close relatives"). Our models do not predict this interaction, even though we use prior knowledge based on the occurrence of the PacC binding site. A recent study shows that sidL is expressed independently of SreA . Our models predict no interaction between these genes, even though it was proposed by the prior knowledge source 3. This shows that our modelling strategy is not blindly adapting to the given set of prior knowledge. If an interaction proposed by the prior knowledge contradicts the measured expression data too much, our modelling approach removes it from the predicted network. The applied scoring scheme assigns the highest score for prior knowledge based on Northern blots. The rationale behind this is that Northern blots are no high-throughput experiments and thus we believe these experiments give strong evidence that the respective regulatory interactions exist. However, the Northern blots were performed at steady state (24 hours after adding iron). On the other hand, the used expression data focused on early effects after the change to iron replete conditions (10 to 240 minutes). This might explain some discrepancies between the Northern blot data and the proposed models. Here, we report the first SrbA binding sites in A. fumigatus. The data revealed a remarkable sequence similarity between S. pombe and A. fumigatus. An interesting future task will be to identify further SrbA target genes and to analyse whether the defined binding sites are conserved throughout other fungal species. All high-affinity binding sites of S. pombe and A. fumigatus show a conserved C at the third position. While the existence of the conserved AT can be explained by the fact that the human SrbA ortholog physically interacts with these nucleotides, the reason for the conservation of the C remains to be elucidated. This study demonstrates how the Systems Biology circle is carried out, i.e. how experimental work and modelling iteratively interact, in order to gain understanding of a biological system. Analysing gene expression time series data and using a modelling approach based on a set of differential equations, we were able to predict new regulatory interactions controlling iron homeostasis in A. fumigatus. Wet lab experiments proved that the proposed modelling approach allows to predict novel biologically relevant interactions. Results of the latest experiments were used to refine the predicted model. Taken together, this underlines that using prior knowledge during network inference improves the prediction quality of the reverse engineering. Together with the experimental results, we identified a new iron homeostasis regulatory network based on the amount of metabolically available iron. Furthermore, we found that SrbA physically interacts with its predicted target genes via specific DNA-binding and identified the SrbA binding site in A. fumigatus. In a previous study, we predicted a regulatory network concerning iron acquisition by the fungal pathogen C. albicans during an experimental infection. This model was based on a similar modelling strategy, i.e. it also exploits gene expression data and uses a set of prior knowledge. In the case of C. albicans it remains unclear which of the predicted regulatory interactions is exclusively based on limited iron. In contrast, for A. fumigatus we do not know which of the (predicted) interactions play a role in an in vivo infection process. Further experiments will focus on time series expression of A. fumigatus in an (experimental) infection and on expression data of C. albicans under in vitro iron limitation. It will be interesting to figure out whether C. albicans also regulates iron homeostasis based on the amount of metabolically available iron. This will give us the opportunity to compare regulations of iron homeostasis for both important fungal pathogens. Together with the growing amount of available expression data for both fungi we will be able to expand our models to other important processes, thus making A. fumigatus and C. albicans model organisms for fungal infections. JL was supported by the excellence graduate school "Jena School for Microbial Communication (JSMC)". HH was supported by the "Fonds zur Föorderung der wissenschaftlichen Forschung" (FWF P21643-B11 (HH)). We are grateful to Uwe Menzel for support in English language and Sylke Fricke for technical assistance. HH and RG directed the study. JL carried out the analyses of the data, performed the modelling, and wrote the manuscript supported by the coauthors. HH assisted in choosing candidate genes for the model. EF and JL scanned for the SrbA binding sites. PH designed and performed the experiments for the binding site. HH, PH and AB assisted in the interpretation of the results. All authors read and approved the final manuscript.